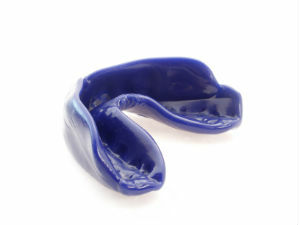 Athletic mouth guards are generally used to protect the teeth from injury during sport activities. There are different types of guards: stock mouth protectors, boil and bite mouth protectors and custom-fitted mouth protectors. Stock mouth guards are preformed and ready to wear. They are inexpensive and can be found in any sporting goods store. One disadvantage to the stock guard is that there isn't much that can be done to adjust the fit, they make breathing difficult and are bulky. They provide little to no protection and most dentists do not reccomend them. Boil and bite mouth guards can also be purchased in a sporting goods store and may offer a better fit than the stock guards. This version of mouth guard is made out of thermoplastic material can be placed in hot water to soften up and then placed in the mouth and shaped around the teeth using fingers or tongue pressure. Custom- fitted mouth guards are the designed for the individual patient and can be obtained from your dentist. An impression of your mouth is made and sent to a lab to be created. This form of mouth guard provides the most protection and is highly recommended.